New year, new smoothie bowls! 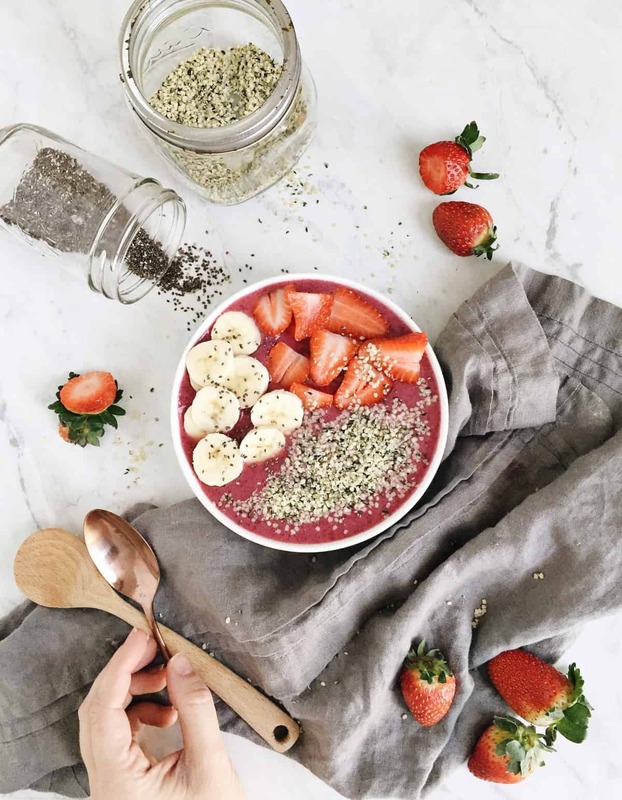 Like this metabolism-boosting strawberry smoothie bowl recipe! 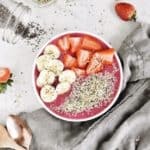 How exactly does this strawberry smoothie bowl recipe boost my metabolism? 1. Berries. Berries are great antioxidants and high in fiber. Antioxidants help keep your cells and body healthy. 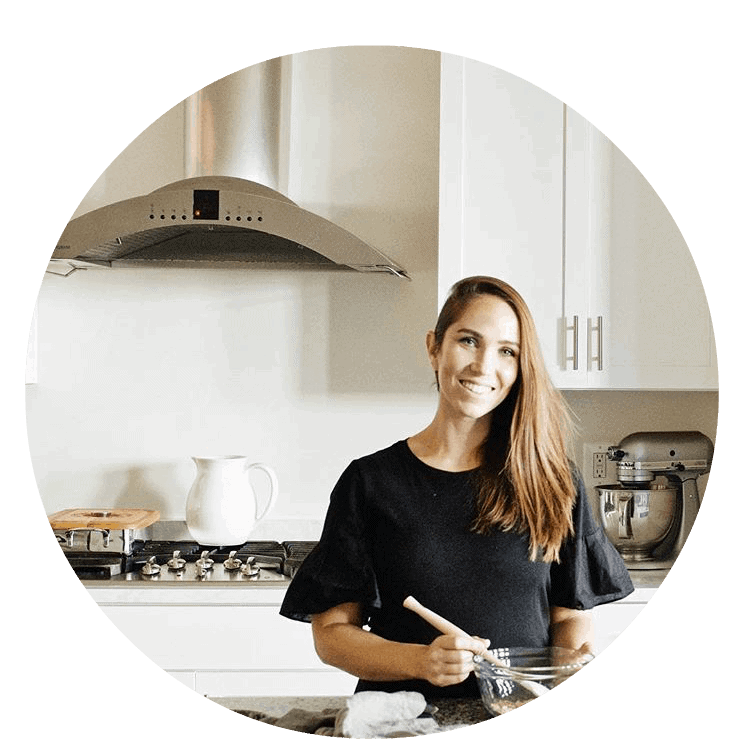 Berries also contain a super fancy flavonoid that has been linked to helping your body create a hormone responsible for lowering glucose levels and boosting metabolism. 2. Chia seeds. Also marvelously high in fiber, which helps your body more easily digest and absorb all those good nutrients! I mix them into EVERY. SINGLE. SMOOTHIE. And then sprinkle for good measure. 3. Hemp heart seeds. These are the food equivalent of that glowing hippie aunt of yours who brews her own kombucha and looks positively fabulous and smooth-skinned at the age of 50. They are a thing of mystery and once you know them, you can’t ever forget them because they change your life! Seriously. They are a great source of protein for plant-based diets, contain all the good omegas for a healthy heart, and fiber! I mostly take them for the protein, since we know that eating protein helps build our muscles to burn fat. How do I make my smoothie bowls thick? You don’t want your smoothie bowl to be soupy or, well, like eating a smoothie with a spoon. They need to be thick, kind of like ice cream. (I pretend I’m eating strawberry ice cream with this one!) The trick is adding as little liquid as possible, and making sure you use frozen bananas! Sure, you can skimp on the frozen banana if you don’t have any on hand. In that case, I recommend adding in a scoop of oats to thicken it. Nothing wrong with some more fiber! Are you convinced you need to make this deliciously easy breakfast yet? I love that it’s vegan, gluten-free, maybe paleo? Whole30? (I don’t really know all the fad diets, but I think this fits into a lot of them!) 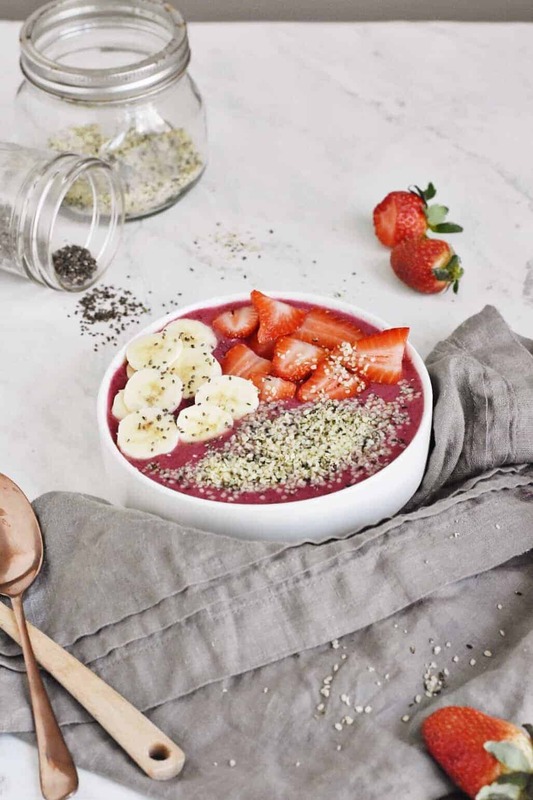 Grab this metabolism-boosting strawberry smoothie bowl recipe below! That moment when your breakfast or midday snack tastes good and helps boost your metabolism. And takes only 5 minutes to make. Yes, please! 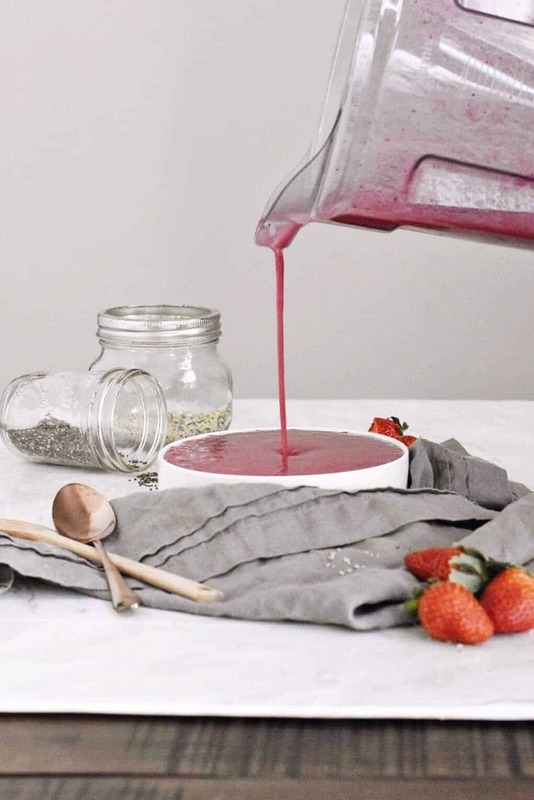 Add this strawberry smoothie bowl recipe to your daily lineup. Top with berries, bananas, chia seeds, and hemp hearts. Feel free to add other toppings like nut butters, granola, etc. Hi, I was wondering if there is anything I could you in replace of bananas (I don’t really like them )? Hi Emma! Frozen mango would work well in this, you just want to make sure it is ripe and sweet. Dates are also a great natural sweetener. OMG, yes. The world needs WAY more strawberry smoothies and blog posts like this in it. Can’t wait to try!